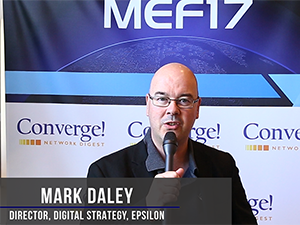 The market for communication services is rapidly evolving and carriers must find better ways to interface their networks, says Mark Daley, Director of Digital Strategy for Epsilon. Better tools for interworking with customers are also needed. Automation will be key. SD-WAN -- Threat or Opportunity? Is SD-WAN a threat to carriers because users may leave their networks, or is it an opportunity? 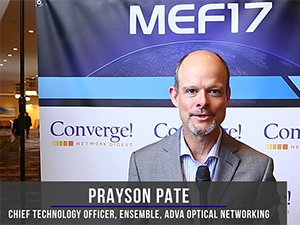 It's both, says Prayson Pate, Chief Technology Officer for the Ensemble division at ADVA Optical Networking. 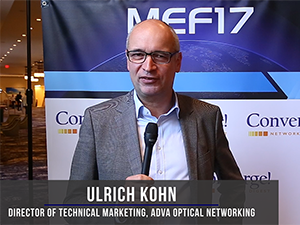 Service providers are seeking to migrate their networks towards NFVi but it is a difficult task because they must transform manual test and assurance processes into automated functions that seamlessly integrate with test systems and the virtual network, says Ulrich Kohn, Director of Technical Marketing, ADVA Optical Networking. At #MEF17, ADVA and Spirent presented a Proof-of-Concept for Zero-Touch Service Activation and Closed-loop Issue Resolution for Virtualized Business Services. 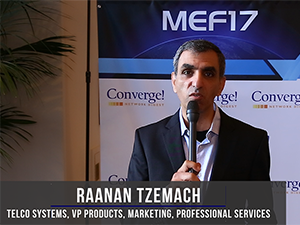 MEF 3.0 brings many new capabilities, including dynamic, orchestrated services across multilayer networks, says Raanan Tzemach, VP of Products, Marketing, and Professional Services, Telco Systems. 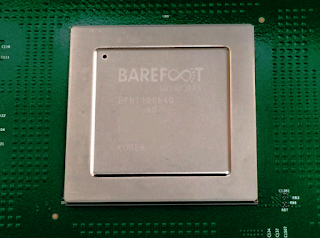 Barefoot Networks, a start-up developing user-programmable switching chips, introduced a network monitoring system designed to provide visibility into every packet in a network. 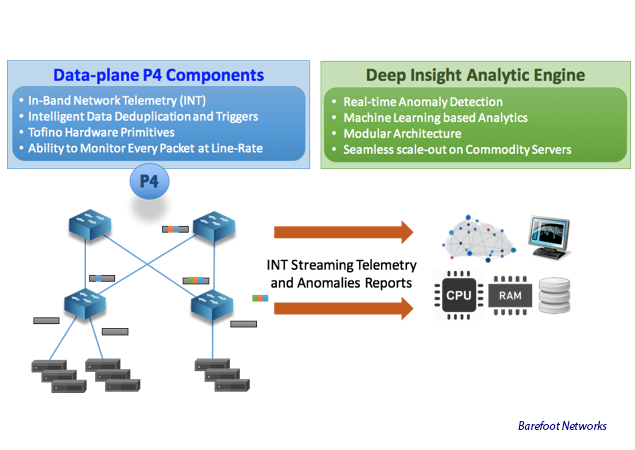 The Barefoot Deep Insight software, which can run on commodity servers and in a network powered by switches based on Barefoot’s "Tofino" programmable switch chip, can interpret, analyze and pinpoint packet telemetry. 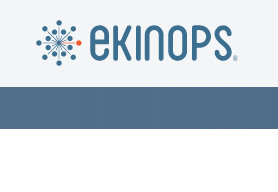 Using stateful baselining of a network's performance, the company says its software automatically filters out irrelevant data, detecting only anomalies at any time scale and with nanosecond resolution. The Deep Insight software is able to track the sequence of switches the packet visited along its path, the set of rules it matched upon at every switch along the way, the time it spent buffered in every switch, to the nanosecond, and the packets, flows and application that the packet shared each queue with. 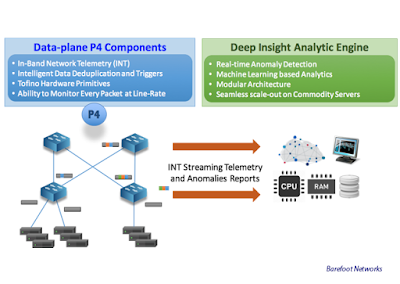 Barefoot is offering the network monitoring system on a pay-as-you-grow model, where customers pay only for the volume of telemetry they need. Barefoot said its Deep Insight system could be especially useful in enterprise data centers, where many-to-one traffic patterns associated with applications such as Hadoop and HDFS can result in congestion, queue build-up and increases end-to-end latency. The Tofino switching silicon can detect the queue build-up and take a snapshot of every packet header during the congestion event. The Deep Insight software could then be used "to visualize the full dynamic of a congestion event, down to each individual packet, exposing the aggressors and the victims flows." Barefoot is also highlighting the P4 programmability of its Tofino chip. This provides the flexibility to design for specific use cases without writing data plane code or modifying the silicon. 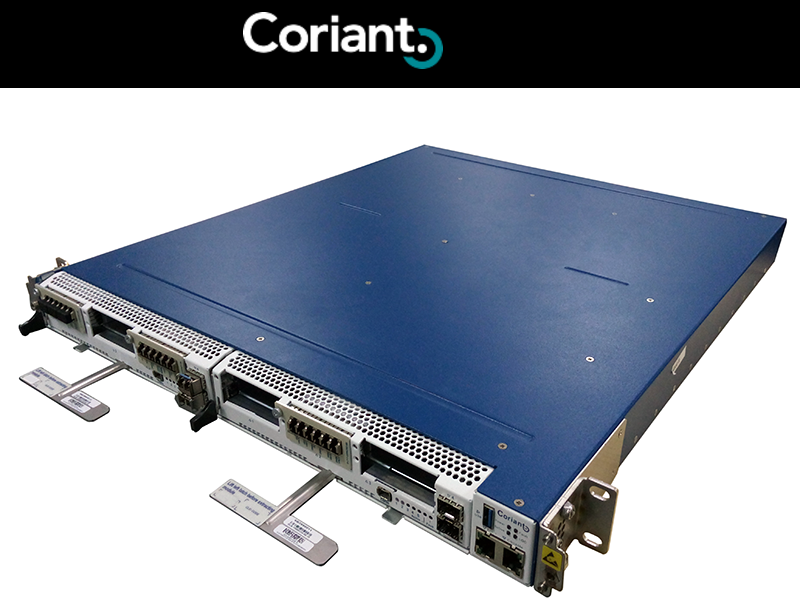 Japan Internet Exchange Co. has deployed the Coriant Groove G30 Network Disaggregation Platform to scale network capacity in its Tokyo and Osaka metropolitan area networks and support the cost-efficient delivery of high-performance interconnect services, including 10G, 40G, and 100G. The Tokyo and Osaka network deployments include programmable 200G coherent optical transmission between multiple data center sites. The JPIX network currently serves over 160 customers, including Tier 1 service providers, ISPs, content providers, Content Delivery Networks (CDNs), cloud providers, cable operators, and digital media companies. The Coriant Groove G30 platform is designed to enable the provision of programmable, high-speed secure bandwidth for mobile, video and cloud applications. The stackable solution supports 3.2 Tbit/s of throughput in a compact and pluggable 1 RU form factor and enables service providers and cloud and data centre operators to build scalable and secure transmission and optical solutions with functionality enabled via open APIs. It can be equipped as a muxponder terminal solution and as an Open Line System (OLS) optical layer solution. Coriant’s strategic local partner is UNIADEX Ltd.
Qualcomm and Microsoft confirmed progress made over the last several months to deliver Windows 10 on Snapdragon. The idea is to use mobile phone processors to run light notebooks. The first Windows on Snapdragon device will be a 2-in-1 convertible ASUS NovaGo that is expected to hit the market early next year. A second device will be a detachable HP ENVY x2 Windows on Snapdragon Mobile PC. Both will be fanless design and will offer support for Gigabit LTE connectivity. Later this week, Qualcomm is expected to preview its next-gen Snapdragon 845 Mobile Platform. CenturyLink announced a contract to provide communications services to Peterson Air Force Base in Colorado Springs, Colorado. The contract includes support for the NORAD (North American Aerospace Defense Command) Tracks Santa program, including enabling the program’s phone hotline. The contract, which also includes Ethernet circuits and private line services, is valued at approximately $275,000 the first year, with four one-year options, for a total contract value of $1.5 million. 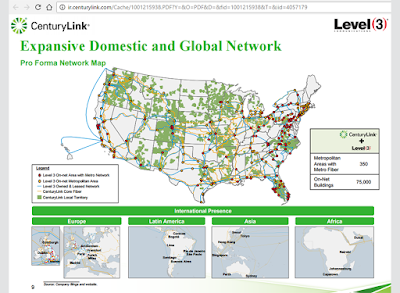 “CenturyLink is honored to provide Peterson AFB with communications services that help NORAD track all flying objects that enter North American air space every day, including tracking Santa Claus on Christmas Eve,” said David Young, CenturyLink regional vice president, strategic government. FiberLight, which owns over 1,700,000 miles of robust fiber networks in over 44 U.S. cities, appointed Don MacNeil as its new CEO, replacing Jim Lynch who will now assume the role of Executive Chairman. 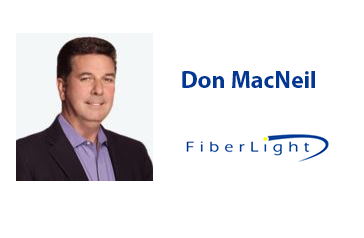 MacNeil joined FiberLight as Chief Operating Officer (COO) in September. He previously served as Chief Technology Officer (CTO) for EdgeConneX, an innovative data center solutions provider, which built a national portfolio of 29 edge data centers throughout the U.S. and Europe. Additionally, Don has held a variety of leadership roles with operations, engineering, sales and marketing teams, and culminated his 14-year tenure with XO Communications as COO. Nutanix has appointed Ben Gibson as Chief Marketing Officer. Most recently, he was Chief Marketing Officer at F5 Networks, and before that, he served as Chief Marketing Officer at Veritas, where he led the company’s rebranding efforts following a spin-off from Symantec. Prior to Veritas, Ben spent five years as Chief Marketing Officer at Aruba Networks.